My new custom background. I will replace this with a theme by week’s end, but I like having the option. System software update 4.50 is live for PlayStation 4 owners today, adding major functionality to Sony’s console. Between enabling external hard drives, the ability to make your own background images and the ShareFactory apps’ new import functionality, the PS4 is a little bit more functional today. First off we have the big one. While the Xbox One and Wii U have been up for the old external hard drive for ages, PlayStation 4 owners have had to satisfy themselves with having to swap out the internal hard disk to make more room. Update 4.50 changes that. Since my Wii U was traded in towards Nintendo’s Switch, I had a spare one terabyte drive hanging about. I plugged it in, formatted it, and I was good to go. External drives are automatically assigned as the default location for new games and apps, but that can be changed in settings menu. Moving an 18GB game from the system drive to the external took about three minutes. Once there, it launched and ran as it normally does. In case you accidentally disconnect your external drive, which I might have done, the system goes through the same process as it would with the internal drive when you power off unexpectedly. Our friends over at Lifehacker created a handy guide for installing an external drive on the PlayStation 4, in case you don’t trust plug and play. Seeing as I had plenty of room on my PlayStation 4 Pro, the most exciting feature in update 4.50 for me was custom backgrounds. Themes are nice, but when you’ve got so many great games with photo modes, why not make your own? I need to take more screenshots, as most of mine were automatic grabs taken during trophy acquisition. I did have a lovely shot from Hatsune Miku: Project Diva Future Tone, so I used that. 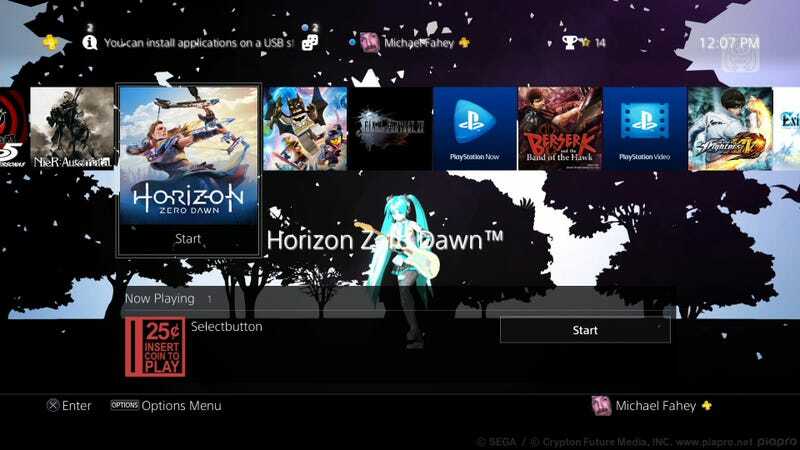 Once an image is selected, users can change the basic color of the boxes and menus on the PS4 to match their choice. There’s also a new option in 4.50 that lets users choose if they want a dark or light drop shadow under menu text, to ensure proper viability with their custom background. What else, what else? Oh yeah, PlayStation 4 Pro users will appreciate Boost Mode, which can significantly increase performance in non-optimized older games. Oh, and they’ve added voice chat for Remote Play, which should be nice for folks streaming PS4 games to their phones or computers. On top of the update 4.50 changes, Sony’s ShareFactory app updated to version 2.50 today, finally giving users the ability to import their own video clips, images and sounds via USB stick. I had no USB. Pft. And I cannot understate the importance of the new ShareFactory infomercial theme. It’s a brave new PlayStation 4 today, ready to be customized, enhanced and shared in bold new ways. Are they things Xbox One users could already do? Yeah? Well the Xbox One couldn’t take screenshots until 2015, so shush.